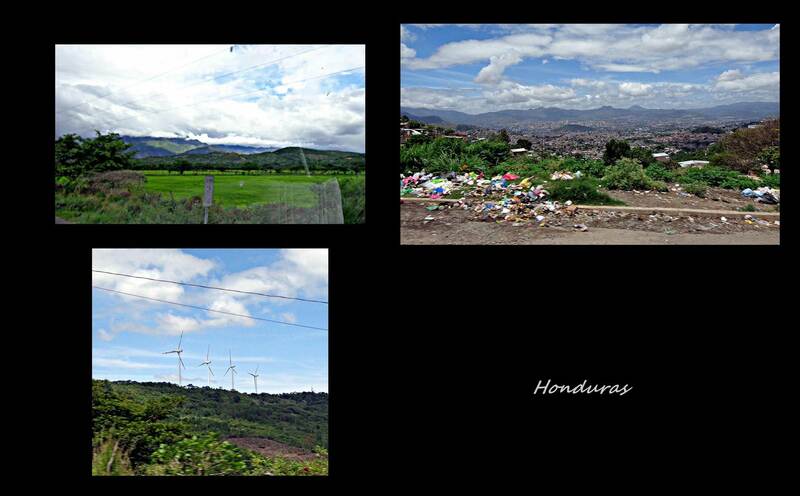 Although we were intent on seeing what Honduras had to offer, we ended up driving through in only two days. We entered at Copan and after an expensive and laborious border crossing we started out to the largest lake in Honduras, Lago de Yojoa. It was only about 120km from the border crossing as the crow flies, but if you were to drive the mainroads, you add more than 100kms to your journey. We figured no road can be too bad for the cruiser and found a more direct route on the map. It was already late when we finally got away from the border, it had started raining (again) and then as Murphy would have it, we didn’t see the turnoff for the shortcut. We turned off at a second shortcut road and soon found out that like the proverb says in Afrikaans, (kortpad..langpad) shortcuts usually turn out to be longer than the original road! And so we drove and drove on potholed roads and as the sun started setting we got to a town only 50km from the border as the crow flies. The next day we started out full of hope to get to Lago de Yojoa. The road ascended through small villages, practically inside the tiny houses next to the road, and when the houses got fewer and further in between, the gravel turned to mud. Soon it got so bad that we were sliding around and we decided it would be wiser to turn back. It took 10 times longer to get back down at a slippery snails pace leaving us right back at 50km from the border. We were getting somewhat discouraged and after initially heading north and then east, we headed south to try and connect with one of the mainroads. Another whole day of dodging potholes and bad gravel finally brought us to a mainroad, still 50km south from the lake. 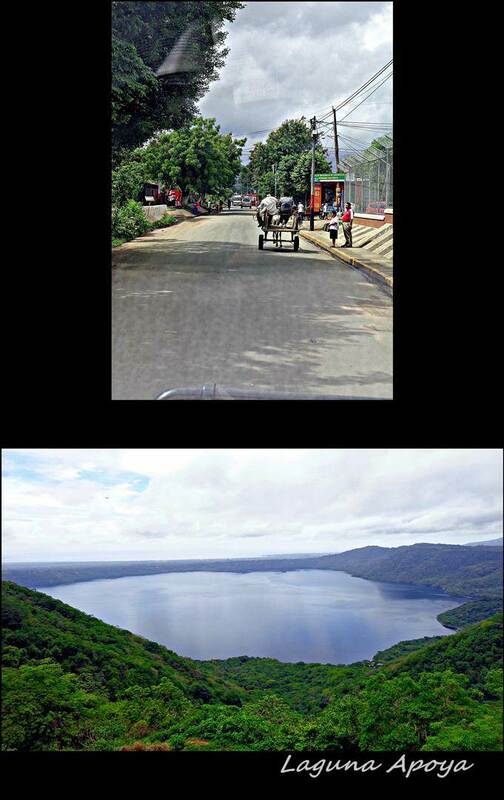 At 17h00 that afternoon, we looked at each other, at the road and at the traffic and decided we had seen enough lakes and also enough of Honduras. 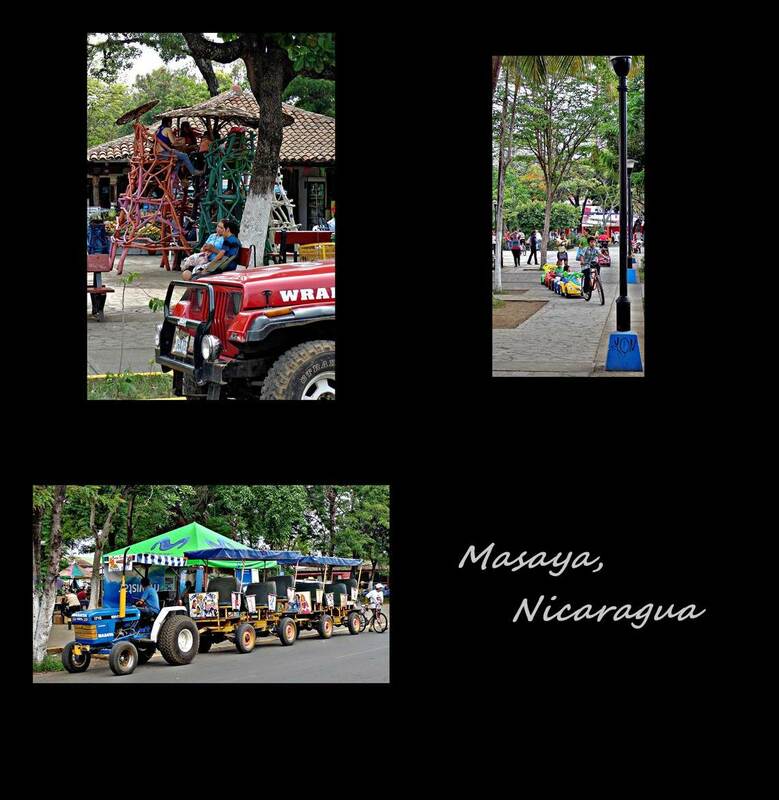 It took another day and a half to escape from the country but we were glad to finally cross into Nicaragua. Later we saw that Honduras is now topping the list for the most dangerous country in the world, so we felt blessed that a Higher hand had safely guided us out of there. It seemed a country without much infrastructure or hope of improvement. We are sure it does have something to offer to tourists, mostly on the offshore islands in the Caribbean, but as for the mainland we would recommend getting through it asap in an overlanding truck. 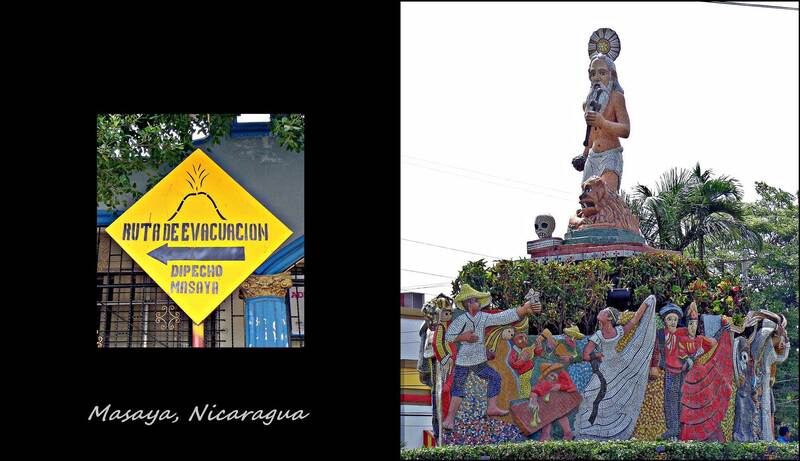 We were delighted to drive over the border into Nicaragua and even the naked crazy woman in the Customs parking area did not shake our belief that we were heading for better things. If you are sure to see one thing in Nicaragua, it’s volcanoes. There are 16 volcanoes (that we could count from the map), and of those 7 are still active. We later read in the Panama guidebook that when plans were being made to make a canal through Central America, Nicaragua was considered but with all its volcanoes Panama became the better alternative. 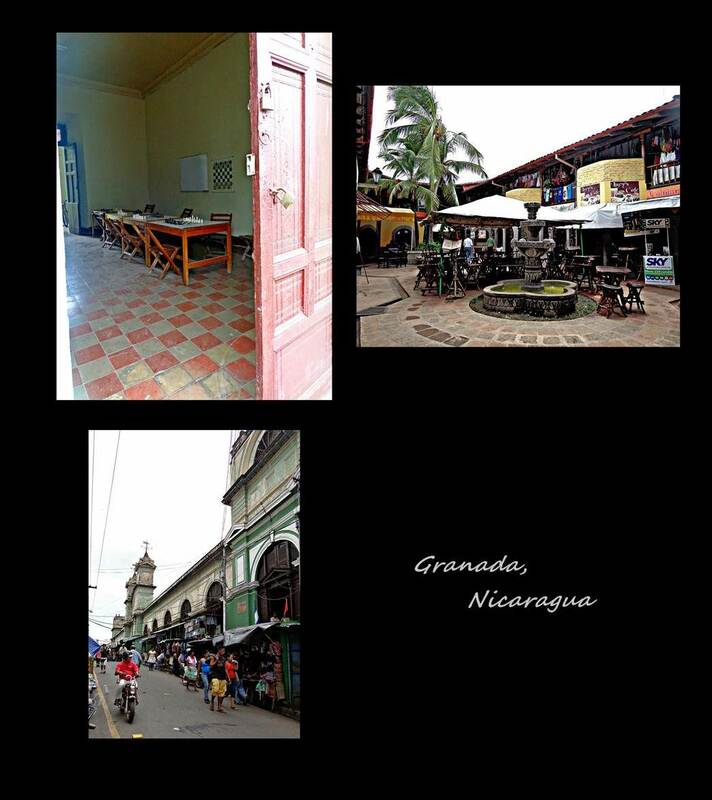 Nicaragua is not a very big country and although there are some roads going to the Caribbean coast, according to the information we had there’s not a whole lot to see there. We therefore stuck to the Pacific coast and on our first night drove all the way to Masaya. Since leaving Guatemala we had been staying in hotels and hostals as all the campsites had now officially dried up. Masaya was no different and with some patience and maneuvering we managed to find a hostal with secure parking. The next day we planned to go to one of the active volcanoes, Volcan Masaya, which had the added advantage that you can drive right to the edge of the caldera instead of having to walk all the way up. We got to the gate and paid the entrance fee and was then told that we could only stay at the caldera for 15 minutes and that all the hiking trails we planned to do was closed for repair… And they couldn’t just have told us before we paid and gave us entry wristbands! When we told them this wasn’t going to work for us gringos, who had to pay three times the amount residents had to pay, they could not refund us because now the precious wristband had been used and they could not sell it anymore. Just what you need at 8 am! With our best Spanish (and Marius’s best attempts not to get angry) we managed to change their minds, get our money back and spin away in disagreement. 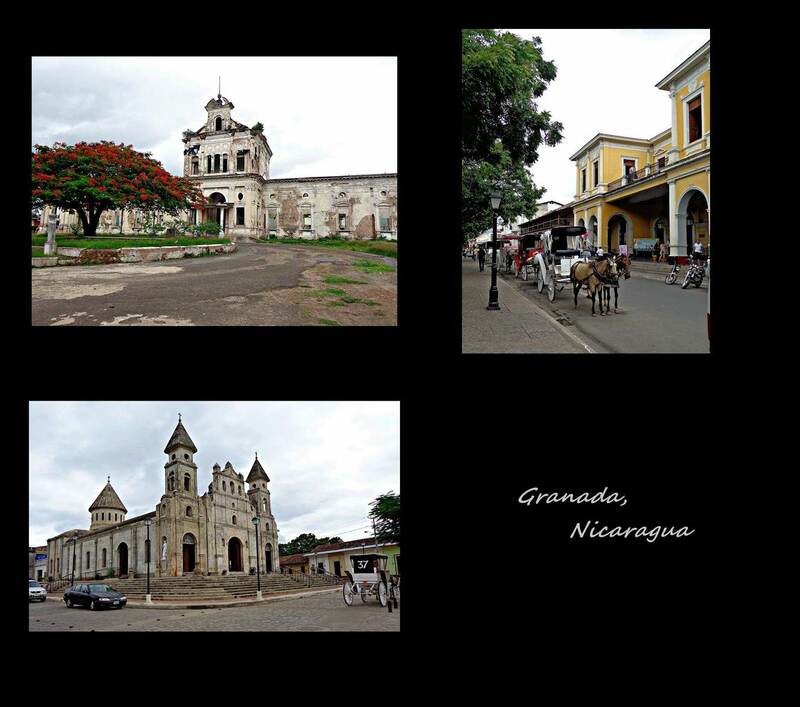 We drove to each of the small villages around Lago de Apoyo , which is a massive volcanic crater now filled with water, and with half of the day left decided to go to Granada. We had heard a lot of good things about this old colonial town and were quite excited to get there. Navigating the busy, one-way streets of this city was nerve-wrecking as always and the heat and humidity didn’t make it any easier. We drove, walked and navigated around town for 4 hours trying to find a place to stay with secure parking, but to no avail. The places to stay was lovely and dirt-cheap and passing up one good room followed by the next, was frustrating. We finally gave up and drove back to Masaya, intent to go back to Granada the next time, but this time we would swop the cruiser for a chicken bus. Next day we managed to catch a chickenbus with no problem at all and were soon holding our breaths each time we scraped past another vehicle. After the third corner we were used to it and started to enjoy not having to drive or navigate. After no time we reached Granada and spent most of the rest of the day exploring the city. There were a whole bunch of antique churches and other buildings and even more tourist snapping photos all around. 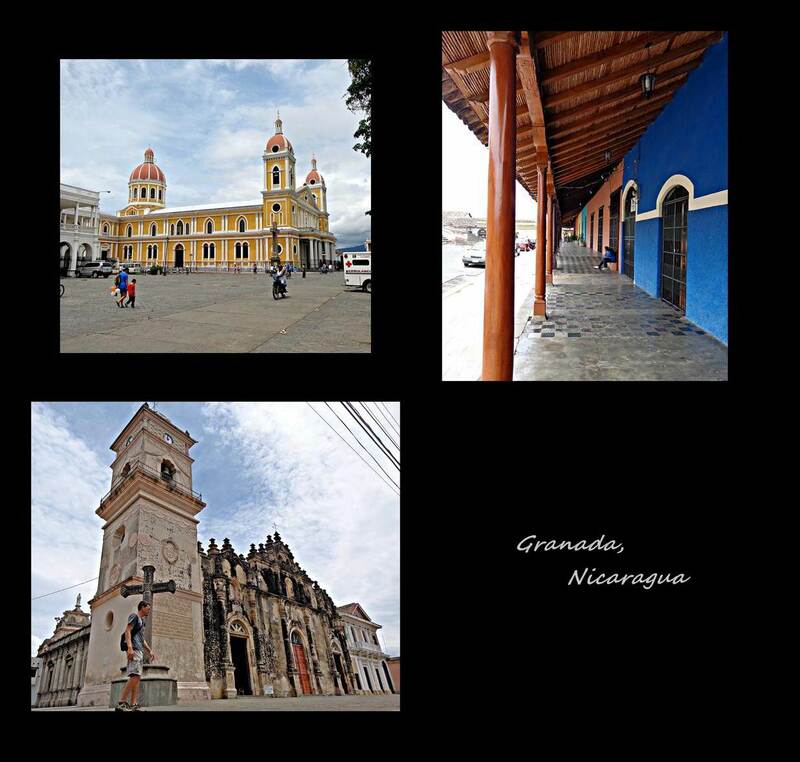 We had cheap coffee and hotdogs along with Granada’s special comida (meal) called Vigoron. It’s supposed to consist of fried pork skin (like crackling/ chicarron), yuka (mix between sweet potato and potato), some shredded cabbage topped with some hot sauce and served on a banana leaf. 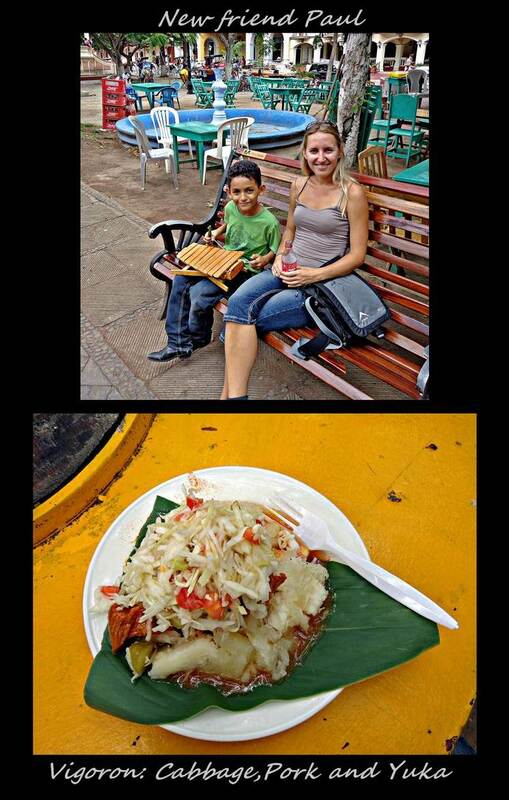 The fried pork skin seemed more appropriate for a true Nica (person from Nicaragua) and so we opted for normal pork. Some of us enjoyed it more than other…but the ice cream for desert made the meal. Whilst sitting on the plaza we met a young fellow named Paul (6) who was eager to correct our flawed Spanish and tell us all about his plans to become a musician one day. He even gave us a little taste on his wooden xylophone. Best of all, the whole day, including the bus trips there and back, cost only U$10/R100! Although we would have liked to visit Isla Ometepe, which is at the centre of Lake Nicaragua, we again had the problem of where to safely park the cruiser, so we headed further south on the Pacific coast to a town called San Juan del Sur. We had the luck of always being too early or too late for some type of festival or event, but this time without knowing it we visited a town at the time of its biggest festival. In San Juan del Sur, it was Saint San Juan’s birthday and it was a huge deal! 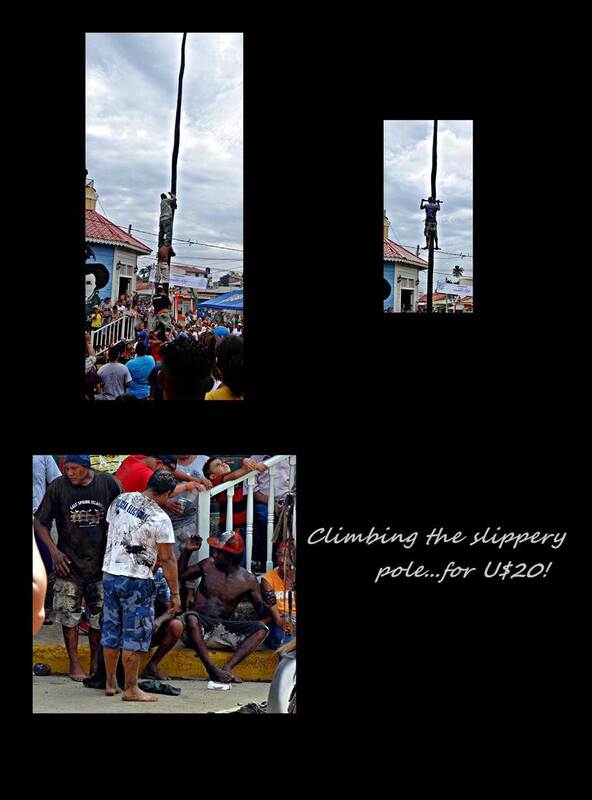 One of the main events, except for the endless fireworks, involved the climbing of 12m pole covered in grease. On the evening before the crazy competitors attempt to get to the top of the pole, they carry it through the streets of the small town, stopping every so many meters to down some type of alcohol. This continues for a few hours before they deposit the huge pole in the town square, where it is planted in the ground after breaking up some of the tarmac in the middle of road. 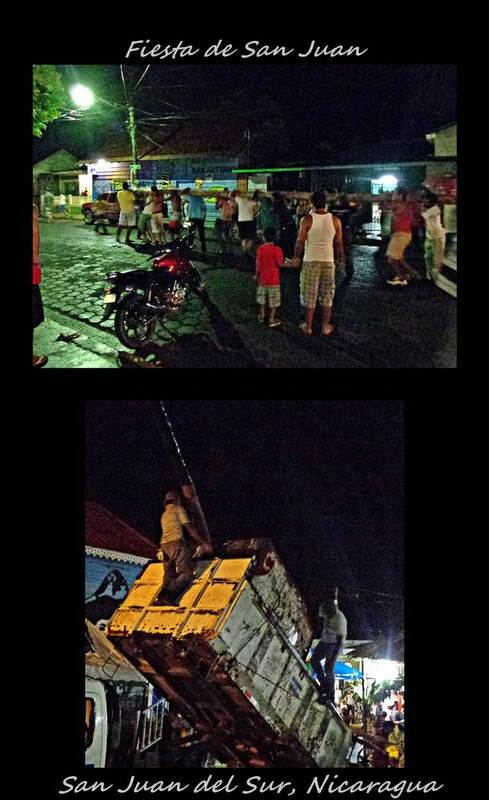 It is then hoisted into place by a small truck where it is held in position by one very brave little man. Just before this is done, however, the whole pole is painted with grease to produce a super slippery suicide device. The next day, just as the temperature turns completely intolerable, two groups of men compete to retrieve a small flag mounted at the top of the pole…their only tools being sticks, ropes and each other! If you are wondering if there is some sort of safety net or mattress if one should fall…think again. The prize you ask….we don’t remember the exact amount, but it was something along the lines of U$20…we guess that’s more or less what a broken neck goes for. Other events associated with this festival involve bull riding. We didn’t go to this event but we heard from some other travelers that this was another daredevil affair… two people died the previous day during this event and at least three people were hospitalized. Thinking back on it now, these events, the continuous fireworks set alight among the crowd and the amounts of fatty foods sold by the street vendors, it seems that Saint San Juan requires some lives to celebrate his birthday…?